The Gallery is a sampling of the best items sold by Vintage Textile over the last eight years. Sadly a few favorite pieces are absent because of space considerations. 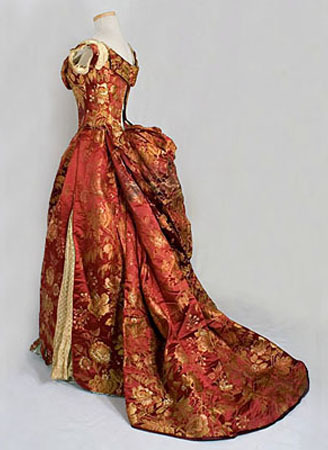 Some items are important historically because they have couture labels and/or provenance such as this magnificent ball gown from the House of Worth. Other items are personal favorites which emphasize design quality. The boy's cotton print banyan (1790) showcases a superb early cotton print. It is all the more remarkable in a child's garment. Finally, we have a Fortuny hand-stenciled velvet cape (1920), an unconditional statement of beauty from the grandmaster of color design. Revel in the subtle transitions: silver to teal blue to bronze-gold. Whether you have just discovered antique clothing or you are an experienced connoisseur, you will take pleasure in the glories of high style vintage clothing by choosing a Gallery category below to view pictures by historical period.